Selling just shy of 2,500 units in March, the Buick Verano is off to a good start in the U.S. But what some may not be aware of is the fact that the Verano’s twin in China — the Buick Excelle GT — has a sporty version that’s not available in the U.S. of A. For starters, the Excelle GT 1.6 sport edition (yes, that’s the official name) cradles a 1.6 liter turbo-charged Ecotec engine good for 135 Kw (181 horses) and 235 Nm (173 lb.-ft.) of torque. These numbers are almost identical to the base naturally-aspirated 2.4 liter Ecotec found in the North American-market Verano, but the 1.6T obviously behaves differently thanks to a different power band of the turbocharged mill. The changes to the Excelle sport edition don’t end with the engine, however, as the Excelle features the FlexRide system that allows the driver to recalibrate the driving mode of the car with the push of a button — think Buick Regal’s Interactive Drive Control. Entering Sport Mode, for instance, adjusts the gas pedal for a more linear feel and changes the damper settings — all in real time — to stiffen the suspension. Touring mode relaxes the car’s suspenders to make for a more relaxed ride. The Excelle also has Xenon HID headlamps with dynamic level height adjustment and a headlamp cleaner. Interesting that Buick decided to exclude both of these features from the U.S.-market Verano. Rounding out the additions to the 1.6T are a rear spoiler, aluminum pedals, and red with black fabric wrapping the bolstered sport seats. The Excelle GT retails from 132,000 RMB, or $20,912 at current conversion rates. Knowing this is possible with the Verano/Excelle Delta II platform, do you think the Buick Verano sold in North America can benefit from such a package/trim? Talk to us in the comments! Previous story Poll: Is GM Making A Mistake By Not Offering AWD On 2014 Impala? GM needs to pull out all the stops with the Verano, this vehicle could be sweet in a sport theme here in the states. Agreed on the engine and color display. No reason even the Cruze shouldn’t have one either, actually. But what of the other features, namely the interactive ride control? With interactive Ride Control we could have the best of both worlds — sporty or soft. But then, if Buick were to be a “full luxury brand,” it would impinge on Cadillac. All the more to let Buick evolve on its own within that huge price gap between Chevy and Cadillac. I believe cars like the Verano and Encore will do that, but we need more. 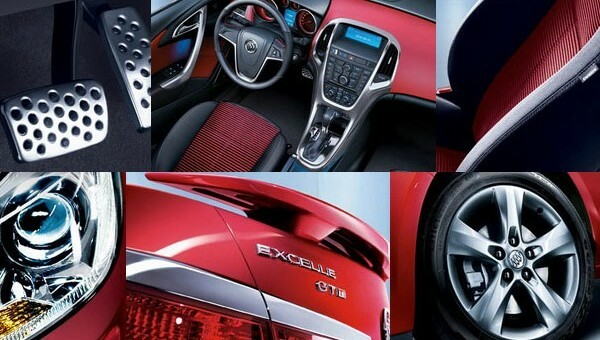 I would welcome the Excelle XT here in the U.S. I don’t see GM adding some of the nice features of the XT to a Cruze Hatch, and then offering them to U.S. buyers. Just won’t happen. But Buick is at least opening the door with the Encore. By the way, I had “interactive ride control” on my 1984 Mazda 626. It didn’t have the plush ride of a Buick in either mode, but at least they were that forward-thinking almost 3 decades ago. Now we’re seeing something just as progressive with SkyActive. After the 626 I felt I should buy American, so I bought Saturns. Running a Saturn for a 100K miles and then tossing it pretty much satisfied me. I didn’t see the sense in spending more for a throw-away commuter car. But then I saw Honda, Toyota, etc. double that mileage, which told me I was missing something by being loyal. I would have gone with the Asian brands but the cockpit fit did not suit my 6 foot European frame. (Even the Saturns were barely manageable.) I ended up with a MINI. Hope Buick will stay flexible and provide comfort for all, even if they manufacture in Asia primarily for Asians. Hey EncoreArmRest, if SkyActiv is so progressive, how do you explain that cars with the technology get inferior MPG than the Cruze that’s 5-10 years behind (on paper)? The answer is that stuffing a car with the latest tech isn’t always the solution. GM is in the process of applying the latest technology to its vehicles (like DI and the Cruze) but even without it, GM vehicles are winning still. What what what?!? China gets HIDs and we dont? The 1.6T belongs in the Encore. I an a GM guy and I’d wait if they could tell me what’s coming and when but nothing, we know that the Verano and Malibu are getting the excellent 2.0 turbo but WHEN ?? Dealers and GM Canada claim they know nothing. The result for me since my HHR “SS’s” lease is up, and their are so many great platforms out there that are available now is I’m going elsewhere, probably a GTI, Civic Si or BMW 135i . I’d like to stay within the GM family (and still have my C6) but I can`t wait for GM to get their act together ! Great job with the site Alex ! Some cars can sell in numbers great enough that they hardly need more affordable versions. The Camaro and the Corvette do this just fine and their performance versions provide more than enough to recoup GM’s investment cost. But cars like the Verano, something that has a lower transaction price and sells in a lower volume, cannot justify the cost of investing in a performance version and expect to make a sizeable return. The writing on the wall is pretty clear in this case and GM hardly needs to be frank with their unwillingness to offer this version of the Verano in NA. It’s the same reason why there isn’t any Cruze SS; although a Cruze SS would be far more likely to be produced than a Hi-Po Verano. @Graw and @Hamilji — there’s another aspect that we may be overlooking when it comes to performance. It’s the effort-time-priority trade off versus payoff. In effect, GM can spend x amount of time developing a high performance variant of the Cruze, Verano, Malibu, etc… or it can focus on project that are much more lucrative, like filling in the holes in the rest of its line (like a compact crossover for Buick, Chevy, and Cadillac… or a midsize crossover for Buick, or a full-size Chevy sedan (Impala), which only started development under the new GM). So when the segments that bring a greater return are filled, then it’s my belief that we will see the more “playful” segments filled, such as the high performance variants of existing mainstream models. It’s really not that difficult to make a profit on the high-po variants even at low sales volumes, as the additional expense of building them is a non-starter in most cases (unless we start talking about adding AWD to the mix or making major changes such as those seen on the Golf R32). I agree that chances of a Hi Po Verano are slim but it is a very nice little car and deserves a better motor which GM already has in the 2.0 turbo ; even with an automatic . I think the car will need more power if it is to be successful. Let’s not forget when we talk economies of scale that the North American parent got the 2.0 turbo and indeed most of the EcoTec motor engineering from Opel so in effect, for free as the European sales have already covered much of it. here. I can understand this for vehicles like the Corvette, as its a “halo” model, but Cruze, Malibu, Impala, and Regal and Verano are the “bread and butter” models, HiPo customers should have the info to make their purchase decisions ASAP as there are other manufacturers out there that do make their intentions known. Make no mistake, I’m a GM guy and I hope my criticism is taken as constructive – I want GM to be THE car company BUT the competition is fierce ! I have learned that with GM Canada, if you are a HiPo guy you have to do your own research and even then be prepared to have them (GM Canada) discourage you all the way…the 300 HP Stage II turbo kit, sold as a dealer option in the USA for Cobalt, HHR and Solstice resulted in voiding of your warranty if installed in Canada…nice EHH !! Beware of this attitude “invading” the USA ! Joseph…..yes, a new engine in the Verano will make this car really rock…..